Artist Willie Bigelow considers himself a Durham native, even though he hasn’t lived here his whole life. Born in Greensboro, Bigelow moved to Durham at age 8 so his father could be the pastor at Greater Saint Paul Baptist Church. Bigelow, now 70, has dabbled in the arts since he was a child. 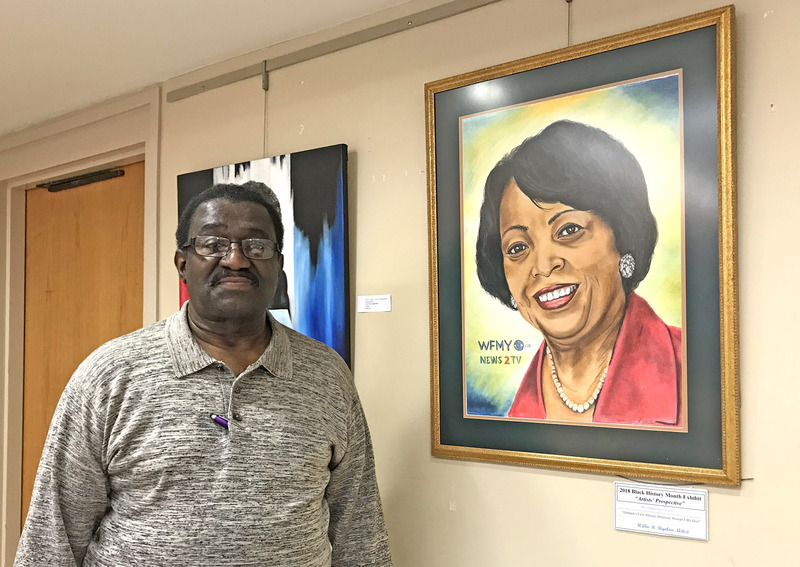 Bigelow was doing a one-man art show at the Hayti Heritage Center in 2015 when he approached the executive director, Angela Lee, about doing an event for Black History Month. Bigelow had the idea to create an art exhibit. The event is called the Black History: Artists’ Perspectives Exhibition. The exhibit includes pieces that reflect “black activities.” This is the third year the Hayti Heritage Center has hosted the event, and it is Bigelow’s third year as the organizer. Hughes spoke at the exhibit’s opening reception on Feb. 2. She said she was deeply honored to be featured in a painting and to be a speaker at the reception. She spoke about the racism and discrimination she experienced in her early years as a television news broadcaster. None of this stopped Hughes. She believes it’s important to have this kind of program during Black History Month because people shouldn’t forget the struggles and injustices of racism. “One sit-in participant, Frank McCann, told me many years ago that we must always tell our children and future generations about the struggles in order to move successfully into the future,” she said. As a 70-year-old man, Bigelow isn’t sure how much longer he will organize the exhibit, but he wants to keep the tradition going. Eventually, Bigelow wants to have enough participation in the exhibit that they will have to utilize the second level of the Hayti Heritage Center. The exhibit opened at the Hayti Heritage Center on Feb. 2. Unless Bigelow and Lee decide to extend the exhibit, it will run through March 11. There are 22 artists featured in this year’s exhibit. This entry was posted in Arts, History. Bookmark the permalink.